Ten issues of the News Bulletin are published each year. Members can receive their News Bulletin in full colour hard copy by mail or as colour pdf by email. Contributions by members are welcome. 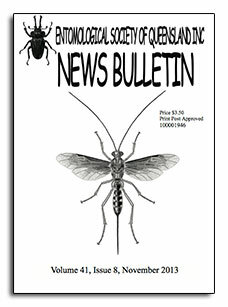 All entomology related news items, articles or book reviews should be emailed direct to the News Bulletin Editor. Bulletins from past years can be viewed in the Bulletin Archive. The Australian Entomologist is a non-profit journal published in four parts annually by the Entomological Society of Queensland and is devoted to entomology of the Australian Region, including New Zealand, Papua New Guinea and islands of the south-western Pacific. Articles are accepted from amateur and professional entomologists. The journal is produced independently and subscription to the journal is not included with membership of the Society. Subscriptions are payable in advance to the Business Manager, Australian Entomologist, P.O.Box 537, Indooroopilly. Qld. AUSTRALIA. 4068. Payment acceptable by EFT (preferred), credit card or cheques in Australian dollars. 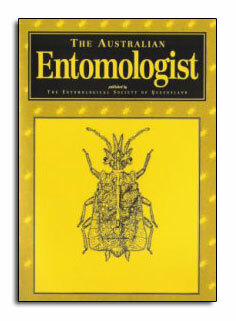 An annual subscription covers a calendar year with four issues mailed quarterly in the months of (approximately) Mar, Jun, Sept and Dec.
Australian Entomologist continues the journal originally founded as Australian Entomological Magazine by Max Moulds in 1974. It was passed to the Entomological Society of Queensland in 1988 and was renamed in 1994. It is devoted primarily to papers (of up to 20 printed pages) and short notes on the insects and related fauna of Australia (and associated islands) and neighbouring territories east of Wallace's Line, such as Sulawesi, the Moluccas, New Guinea, New Zealand and islands of the southwestern Pacific. Papers from territories west of Wallace's Line, such as the remainder of Indonesia and Malaysia, may be considered if deemed of relevance to the Australian fauna. Papers on the biology of insects of any order are especially welcomed and the Journal has a well-established emphasis on the taxonomy, biology and distribution patterns of Australian butterflies. All papers will be forwarded to two referees and the editor reserves the right to reject any paper considered unsuitable. Papers of a purely economic or statistical nature are rarely accepted.